It's time to talk about Chapter 2 in "A Well-Built Faith: A Catholic's Guide to Knowing and Sharing What We Believe" as part of the Lawn Chair Catechism series by Catholicmom.com. God passionately seeks to enter into a deep and intimate relationship with each one of us. To that end, God reveals himself to us.... Since the dawn of creation, God has been revealing himself, inviting men and women throughout the ages to enter into relationship with him. We call this act of God's self-revealing revelation. My favorite line from Chapter 2 - "Since the moment of our birth, God has been pursuing us, seeking us out, and inviting us to a deeper relationship with him." This talk of God revealing himself to us made me immediately think of our parish priest, Fr. John Rooney. In his time with St. Angela Merici, a consistent theme in his homilies has been God's yearning to be in relationship with each of us. Fr. John reminds us that God is always there, loving us, waiting for us to love Him. God was there first, waiting for us to respond and He will continue to wait for us, even if we turn away from Him. God loves us and wants to have a personal relationship with us. What a marvelous thing to realize and accept. God loves us, want us and will always be there for us. Wait, I need to say this another way to make it stronger... (Say it out loud). God loves Me, Wants Me and will always be there for Me!!!! When you say it with "us" it sounds all nice and caring, but when you put "me" in there, it just hits home. And, saying it that way always makes me smile because I know it is true. If God is always there wanting to be with me, loving me, then what do I need to do? In essence, the author reminds us that being in a relationship with God is not about what we do, but how we respond to God's invitation for us. We need to recognize His revelation and respond to God with humility and love. How do you respond to God's invitation to love Him? 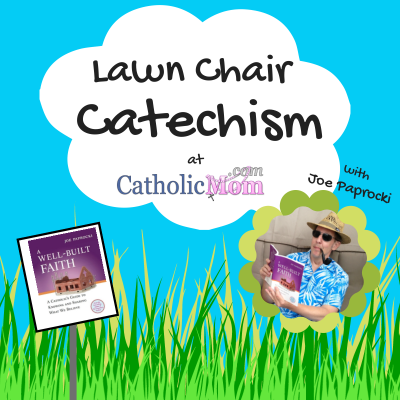 * Follow the weekly Lawn Chair Catechism series at CatholicMom.com and our responses to the summer series at Of Sounds Mind and Spirit.